Rechargeable lithium battery attached, no worries about treatment interruption for dead AA batteries. And there are specially battery designed indicator reminding you charge timely. 8 top quality attachment pads included: 4 medium pads, 2 large pads, 2 small pads. Choose the suitable ones for different pains. 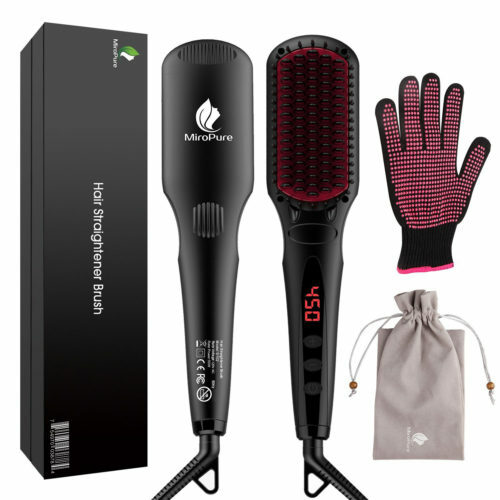 With 12 modes and 20 levels adjustable intensity, allows for treating six areas simultaneously with more choices. When we use this TENS unit, customer need to put cable into channel A or channel B. The positive electrode cable and negative electrode cable need to use at same time. Otherwise, the power is weak. Easy to use and total body care: use for back, knee, shoulder, ankles, wrist and elbow and make this the most powerful weapon in your fight against chronic pain. Small and lightweight: it’s portable to travel with you anywhere you like. Take it to the gym, on a trip, or even to the office – it fits your briefcase or purse. in order to be environmentally friendly, we have electric manual and paper manual. By placing the pads exactly at the site of the pain, you get fast relief, without having to digest potentially harmful or addictive prescription medicine. 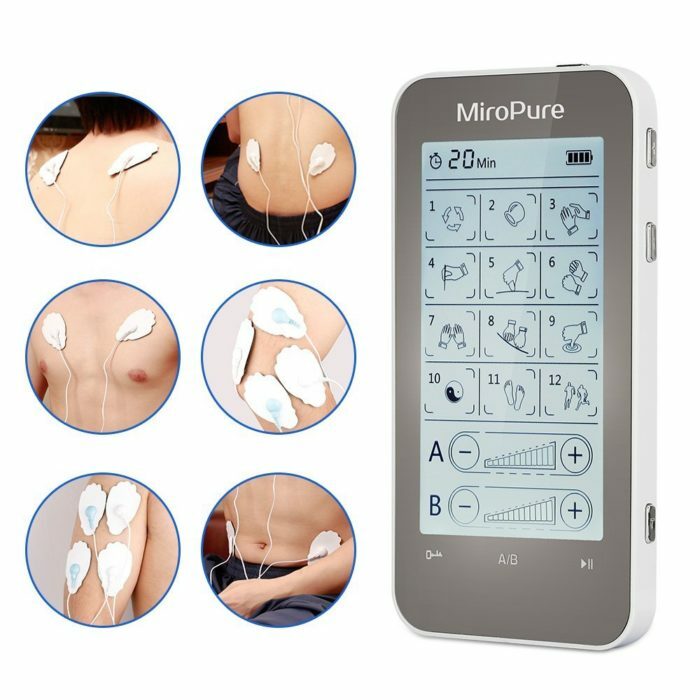 MiroPure Tens therapy has FDA, CE certification, which is considered free of side effects, so that you can use it whenever you need! You can choose the mode you like. 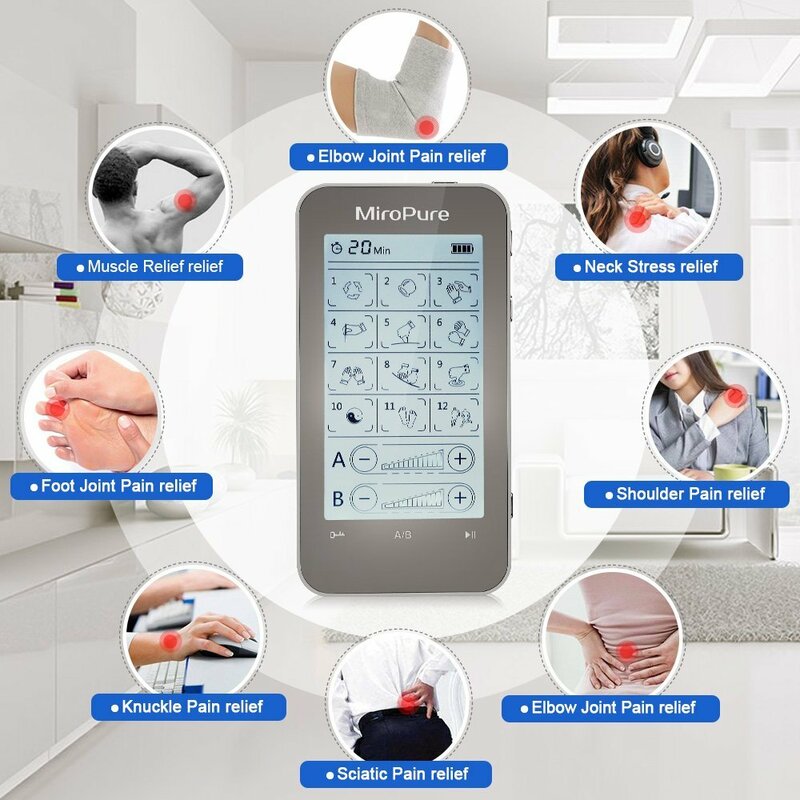 The MiroPure tens is designed to treat pain in the knee, calf, thigh, elbow, arm, neck, shoulder, wrist, hand, lower, and upper back. You can set the time you want to relief the pain,there are several time to choose from 10-60 minutes. Meet different needs and no worries about over-treatment; Increase “+” button from level 1 through level 20 or decrease ” -” button from level 20 through level 1 on the right side of the unit. Question: Approximately how long does a battery last? How many hours of use? Answer: The battery last a long time. 10-15 20 minute sessions per charge. Question: Is the battery replaceable? Question: are touch screens glass ? Question: Can u use this on your neck? Question: Purchased this unit. does not include charger. thanks. now i have to buy a charger. 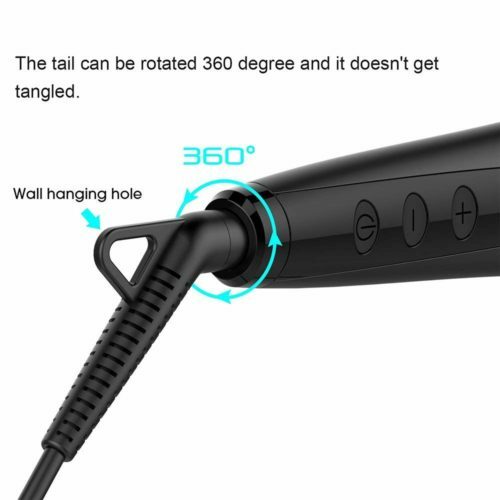 what charger do you suggest? Answer: I love mine go the terrible back pain. My unit came with a charger that jus plugs into an AC plug u can buy anywhere, even at 99 cent store… or just plug cord that came into ur computer’s universal ports. Question: How high does the timer go?? Question: Where can I buy more pads? Answer: There are two ports, A and B. Each is set separately so you can use up to six pads at a time if you use the 4 pad cord in one port and the 2 pad cord in the other. They must be used in pairs only, so you can use 2,4 or 6 pads at a time, depending on which cords you are using. Question: If it doesn’t have a clip on, how do you use it when you are moving around; where would you put the unit? Answer: I put on a sweatshirt and put it in the pocket. Question: Will this unit lock on a setting and max ammount of time will the timer run? Question: Are the pads reuseable? Answer: Yes, the pads can be reused multiple times. Question: Is this a combo tens & ems unit? Question: Can you adjust the strength in pads separately!? Question: Are the cables for the pads long enough to be able to manage the unit while the pads are attached to your back? Answer: Yes, the length of the cables allow you plenty of slack to manage the control unit.. Question: Well i have been looking everywhere, what size connector for the pads is it a 3.5 mm snap connector? Answer: Yes it is. The pads come with 3 different size pads. I love it. Having lower back pain after building a deck. Normally I word be sore for a couple of days but not the time (tried heating pad, soaking in the tub and Aleve wit no real relief. I had been hurting for over a week and someone said I should try a Tens. I found this on Amazon with good reviews at a fair price and got it. I have only used it one day and it helped. I was given a TENS unit by my doctor many years ago, and it finally conked out. This one is sooooo much better. There are so many variables that you can customize your session to how each part of you is feeling. There is an A and a B outlet, so you can treat two different spots with differing intensities. The cords connect to either 2 or 4 pads, so you can really maximize the treatment in each session. Easy to use, and it is powerful! Rechargeable means no batteries to buy. Also, I had the need to contact their customer service, and what a pleasant experience. I would highly recommend this one to anyone for both product and customer service. seems like a good one! so far so good – easy to use, works well, arrived quickly! Great machine! Bought this as a gift for my mom and she loves it. An upgrade from the old ten unit machine she had before. There are different modes, you can target multiple areas at the same time, set different intensity levels, and easy to use! Great price and great product. I like the touchscreen and that I can switch between modes easily. It’s also easy to change the intensity. No knobs to turn that some other units employ. So far, I’ve used this on my neck/shoulder and my ankle and have gotten good results. Looking forward to using it on my back when I have tightness there. All in all, a good little unit and I like that it came with three different size pads. This has helped my neck a good bit. Everytime I use my headaches aren’t coming on and finally get a bit of relief. Overall, this unit is quite good. No need to turn this unit up too high to be effective. The only critique I have is the touchscreen is very insensitive and does not stay active long. I purchased the MiroPure TENS unit primarily as an alternative treatment for joint pain in my knees due to arthritis. There were several TENS units available but chose this one because it has a rechargeable lithium battery which made more sense than continually buying disposable batteries. Will admit that I just started using it and surprisingly my knees do feel better. The unit works well and am quite satisfied with the purchase. 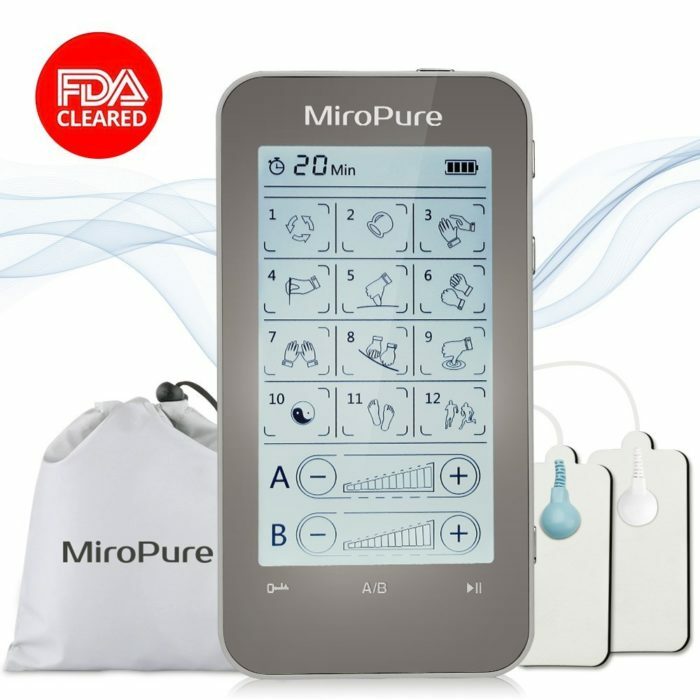 Unfortunately I could not give this a 5 star rating because it was missing the acupuncture point chart but I would recommend this product to anyone interested in TENS or EMS. For a low price Tens unit, I didn’t expect such a great customer service MiroPure has provided. The unit is very easy to use and can be compared to medium cost TENS unit. However, the customer service is more than I expected, I owned TENS 10x more expensive than this and they do not provide enough support, even ignoring my email. I recommend this product. Seems mostly good for now. First I have to say that it arrived quickly and was packaged well. The unit works pretty well. I knocked off a star because it feels very cheaply made and I don’t have high hopes that this unit will last. The screen is like a fake touch screen that requires quite a bit of pressure to interact with and it’s not too responsive. I do like the screen lock feature so you can set it up and lock it which means the settings won’t change when you put it in your pocket. I would say if you are not clumsy and/or treat your devices with care or you don’t mind risking a purchase on a device that doesn’t feel very substantial it’s probably a good purchase but I haven’t had it long enough to know for sure. Works better than I expected. Lets you choose the type of massage you want, and the intensity. Easy to use . Small and lightweight enough to take with you wherever you go. I have immediate relief of arthritic pain symptoms, and it relaxes me too. Excellent, well-made product. Highly recommended. Unit is effective and does the job! Sleek design, easy to use! I have loved using this to help my back pain. 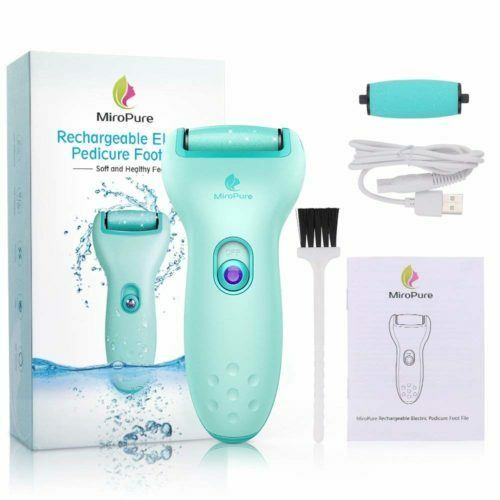 The Miropure is more than what I expected. Very good TENS machine. I hope it’s durable!! Love this little machine. It’s only been a week, but my back pain is much less than it was before I started using this. I hope it continues as my pain went from a 7 to about a 2. Only time will tell if it will fully heal, but I am 46 and was in terrible pain for 3 months. I just bought one for a friend of mine who has similar lower back pain. This unit worked excellent for me but after 7 months the unit stopped functioning. I contacted the seller and manufacturer both seller and Miropure responded to me immediately and is sending me a new unit no questions asked! It was refreshing to know that there is still sellers and manufacturers out there willing to stand by their products and take care of their costumers. Thank you again for all your assistance. This unit is well worth it! I’ve been using it to treat nerve pain and it’s been a life saver! Hands down best unit for the price. And stellar costumer service! Easy to use!! Great price!! 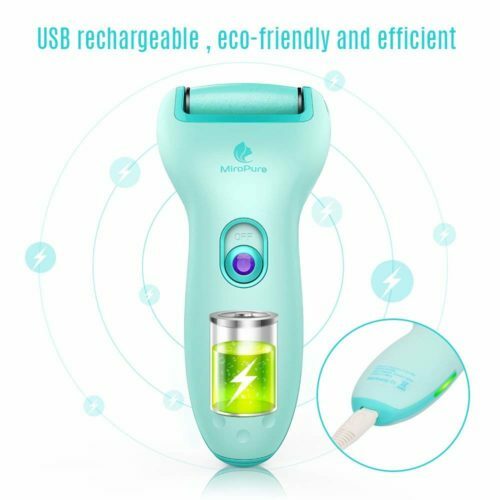 Easy to use and works great!! Great price!! If needed, I definitely will purchase again. The unit is ready to go out of the box! I was happy to find it was fully charged and ready to use. I read the included instructions and began using the unit within 10 minutes. Sadly, there was no description of each of the modes/icons in the instructions. I had to sample the 12 different modes to find what provided the most relief. This tens/ems unit is quite powerful, I have only used up to level 4 to treat my neck/shoulder pain. I am using this device daily with a heating pad, as recommended by my physical therapist (PT), and it is helping to loosen a very tight neck/shoulder muscle between PT appointments and accompanied by prescribed exercises for long-term healing. 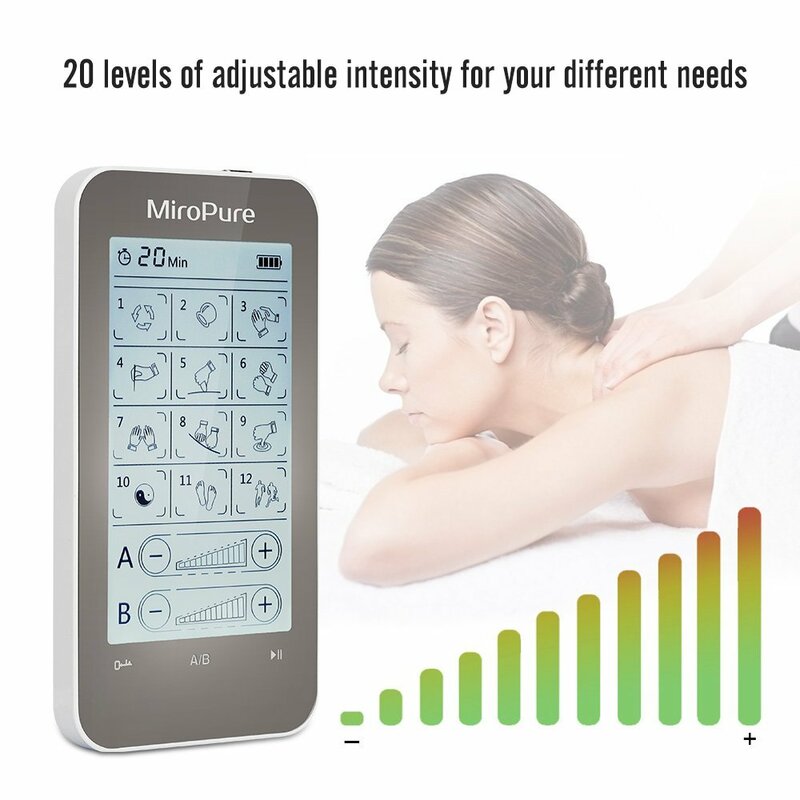 I would recommend this unit to anyone experiencing muscle pain for temporary (or possibly permanent) relief. I don’t know why I didn’t order this earlier. This unit is great. The charge lasts a long time. And love the different types of stimulation and the equipment that came with it. Thank you! 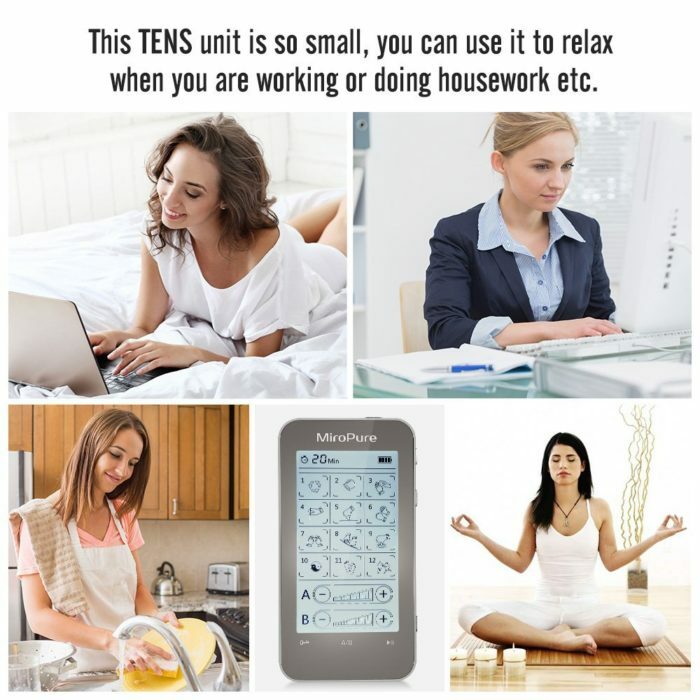 I have been using tens units for about 8 years. My previous tens is only a single channel…and was taken over by my hubby. I decided to “upgrade” and get myself a new one, thinking I would have to pay $50 or $60 to get what I wanted. I found this one and, for only half the amount I thought I’d have to pay, decided to give it a whirl. Man was it a great decision and a great value. 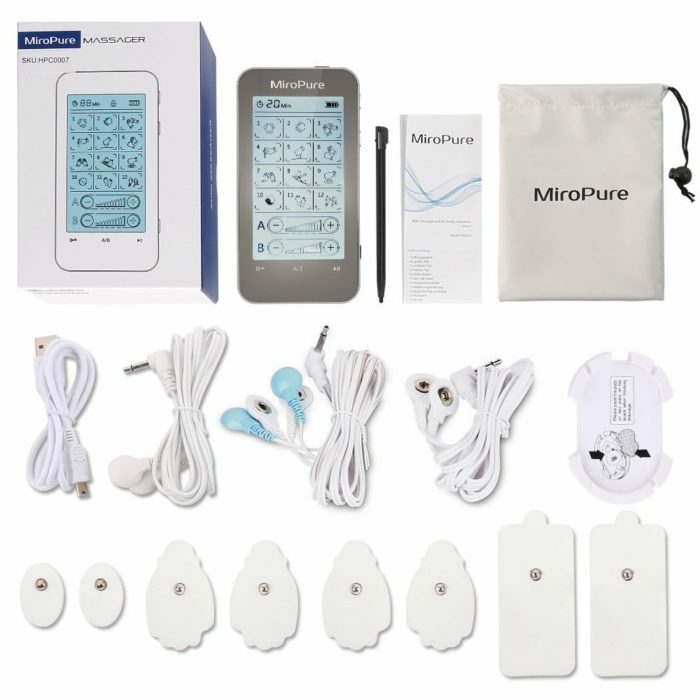 Nice packaging, quality wires, quality pads, and a nice little hand unit that feels like your using a basic little smart phone. This unit is DEFINITELY worth the money. The cute and efficient machine is really working wonders. The signals are very strong and the unit has a variety of 12, from the serious workout to acupuncture. I only tried 4 or 5 of them but they are good. The machine is compact, modern looking, and relatively easy to learn. I tried it during exercises, with my PT and while doing house chores – all without a hitch. No problems at all. And customer service in UK is wonderful. It is a keeper. I like the wide variety of modes and the surprising kick the unit has for something the size of a small cell phone. My only issue is that the pads have some sticking issues. I really love this! Helps my back when it really hurts. There 12 settings are very strong…some actually HURT! LoL! I highly recommend this machine. I have been having foot pain from working has been really helpful for me. I didn’t believe the reviews but it totally works! I have sent one to everyone I know who has back problems and they all agree! Edited: The customer service is great. I had mentioned that my unit wasn’t working properly and I had a replacement unit within two days! My replacement unit is much better than my original. I think the plug on the old one was too loose so it wasn’t able to power the electrodes properly. With the new one I am getting a greater amount of pain relief because the unit is stronger. This item is great for a massage like sensation. Works well for my tight muscles. I lift 6 days a week and as a result have developed knots in my shoulders that haven’t gone away through physical therapy, massages, and personal streatching for years. This elimites the pain in about 10 minutes. It’s packaged very well. The product feels like it’s quality, and it comes with plenty of pads and a nice draw string bag. If you’re looking around through the hundreds of options on Amazon, I would pick this one 10/10 times. I’m 34, not overweight, and try to stay physically active, but I’ve suffered with back pain for 15 years and have also had lower back surgery due to a genetic disease. Every now and then my back goes out, and recently it was so bad I could barely move and was nervous I may have ruptured another disc which might require another surgery. I ordered this with a friend’s recommendation and I am beyond pleased. After only two uses I got my mobility back with almost nonexistent pain. For me this has been more helpful than physical therapy, epidurals, massages, or pain medication. If you suffer with chronic back pain I highly recommend this product. The battery life is great, the 12 settings are a huge plus, and the different sized pads are great for targeting different areas. I consider this one of the best investments I’ve made for my physical health, because my back hasn’t felt this good since I was a teenager. This is amazing. It comes with a few replacement pads for application on different body parts. It’s great for when my neck and back are bothering me, and I also use it to help relieve menstrual cramps. So happy with this TENS unit! I like the touchscreen where I don’t have to mess around with dials. I can’t go much beyond the second lowest setting because this one is pretty powerful. Some but not all of the programs seem to give you a quick initial shock when you switch from one to another. Overall I would recommend it. This is a great unit to have at home. I bought one and 2 of my friends did also and we all love them. This works great! 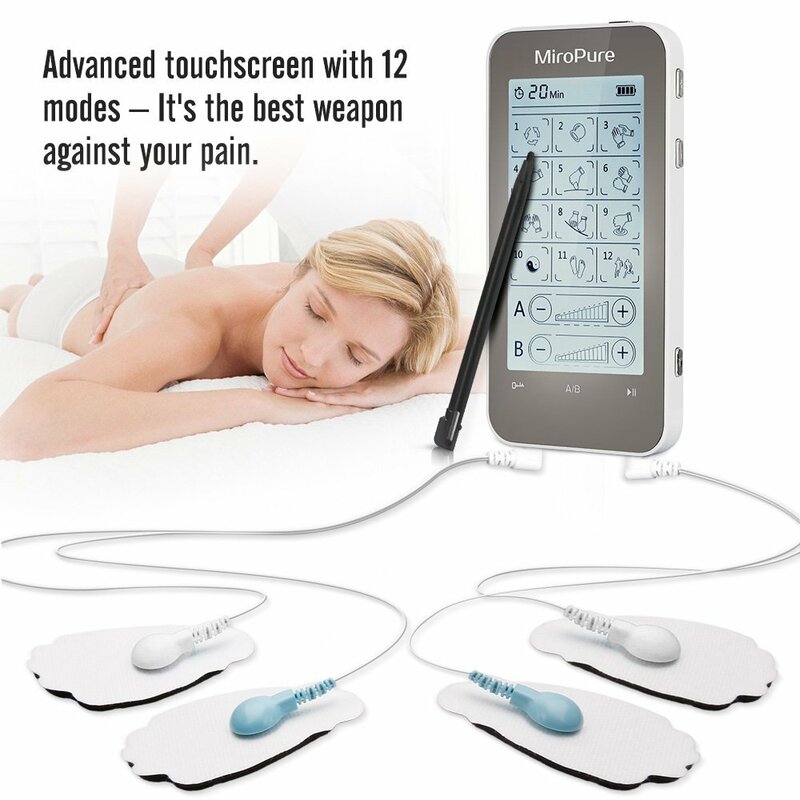 When I get back pains, I use this device to massage and I feel good afterwards. I recommend….. Happy with product like ability to place 6 pads at a time. This is one powerful little product! Great investment. I ordered here but we had problems receiving and found somewhere else. 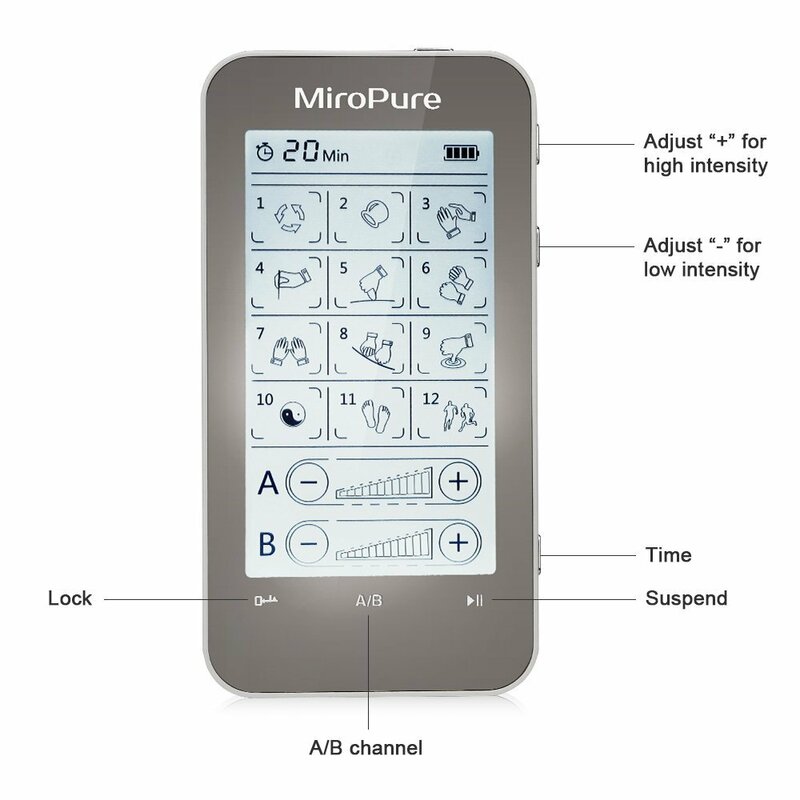 This is a powerful unit at a great price and great for chronic pain and people in physical therapy. I just wish the replacement pads weren’t so pricey. It does what it says it will do. I got it as an experiment to help with a sore back. I generally like it and find it fairly easy to use. If you are hurting it might be worth trying. I don’t use it a lot, but it does distract from really bad pain and might help some too. Love this product wish it atleast came with gel or more pads then what they offered but all around worked wonders on my back. Works like a champ, no issues so far. Amazing results. I like all the different variations. Once in a while the unit will do strange things… like switch to a different kind of massage or the screen will not light up when touching the screen without rebooting it. Other than that, I would recommend this product. After some searching I have learned how to use the device for some areas. The acupuncture point chart was not in the box. I love this device. So many options. This was a lifesaver for a torn muscle in my shoulder. It really helped with discomfort. Easy to use! Gets the job done! Simply cannot beat the features or price. I have 2 TENS machines, this is by far the better of the 2. Battery lasts for at least 30 uses. Touch screen is ideal, lock feature is the key. Tons of pads come with it, can run A & B separately which is handy. Pads don’t stay sticky for long, but use a little water to refresh the tack. This does the job. I have some strained muscles in my back and this really helps. Works great. Very strong pulses and I have not even turned up over medium. I was skeptical, but this works!